Home › Blog › What is the role of high voltage cable on C-arm? What is the role of high voltage cable on C-arm? 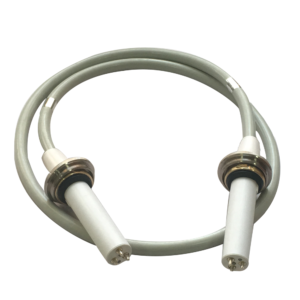 Newheek’s high voltage cable is an important accessory on the C-arm. C-Arm is a medical imaging device based on X-ray technology that can be flexibly used in various operating rooms in the clinic. This name is derived from a C-arm for interconnecting an X-ray source and an X-ray detector. The C-arm includes an image intensifier called a generator of the X-ray source and a flat panel detector. Newheek’s high-voltage cable can be connected to the tube and generator on the C-arm. Two high voltage cables are required on the C-arm. Newheek’s high voltage cable is available in 75kv and 90kv models. Typically, a 90kv high voltage cable with a 150kv x ray tube; a 75kv high voltage cable with a 125kv x ray tube. In addition, Newheek’s high-voltage cable connectors are customizable, and the length of the HVC is also based on customer needs. If you want to know more, please inquiry our customer service. What is the application of high voltage cable?